The days are getting shorter, the nights are getting cooler, and the camping sites are calling. If you’re planning a canoe camping adventure, you’ve made an excellent choice. It’s one of our favorite ways to enjoy the great outdoors—especially when you travel by canoe. Canoe camping trips are unique, fun, and a little more remote, since not everyone can make it that far down the river. For the best trip, make sure to pack the following canoe camping gear. A three-season tent is good to go in the spring, summer, and fall. They’re lightweight, provie protection from rain and wind, and offer a healthy amount of ventilation. We prefer three-season tents while canoe camping because they pack up smaller and lighter than their bulkier counterparts. 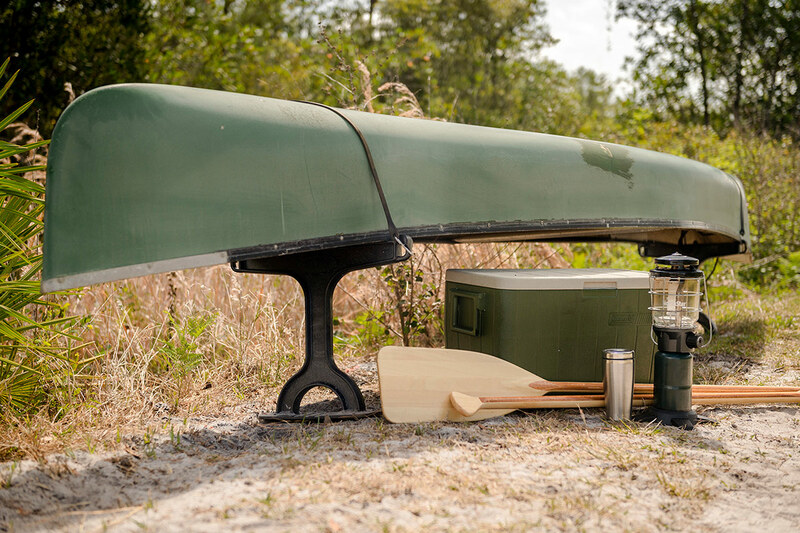 When you’re limited to bringing only what you can fit in a canoe, every ounce matters. When you’re traveling by river or across lakes, your stuff is going to get wet. A wayward splash from your paddle, a badly timed capsize, or a sudden downpour can all drench your belongings and ruin your trip—unless you pack your most precious items in dry bags. These waterproof bags come in all sizes, and we recommend a big one for your sleeping bag and a smaller one for electronics and other sundries, like campfire matches. One of the best things about canoe camping is the ground you’re able to cover. Thanks to the fast-moving boat beneath you, the miles tick by, offering you the chance to see and experience more of the wilderness in one weekend than you ever thought possible. Make sure your trip isn’t cut short by fallen trees or overgrown shrubbery, and pack a hatchet and folding saw that can slice through these obstacles and clear the way. Remember the previous items on this list? Yeah. You’re gonna want to be prepared for anything. You can buy a first aid kit just for camping, or you can create your own by purchasing the following items at any drugstore: bandages and gauze pads of various sizes, antiseptic creams, sterile wipes, pain meds, sunblock, allergy pills, moleskin for blisters, and hand sanitizer. We may be biased, but we couldn’t leave our own product off this list—especially when a pair of Shore Tees will make your canoe camping trip that much better. This portable and affordable canoe and kayak rack will keep your boat safe and secure while you hike the trails or relax by the roaring fire. When your trip is drawing to close, your boat will be clean, dry, and ready to carry you comfortably home. Are you planning any fun fall adventures? Visit our Facebook page and tell us where you’re headed. Happy trails! Great idea for those who have "summer" homes, cottages, no more room in their garages, or just quick access to their water toys. With an easy pull from the dirt, they're ready to be stored. Great idea, especially for "gear-heads" like this 23 years (not my age) kayaker Nana. By storing your kayak with the bottom up, there's no worry about rainwater getting inside. I use mine primarily for washing and cleaning out our "yaks" as I prefer to store them inside my garage out of the weather. Received one as a gift and works as intended. It's great to put your kayak or SUP upon to wash: then turn it over to wash the reverse side and air dry, wax, or dry. Well designed, quality construction, good looking. Worth the cost! Easy to use and nicely constructed. Highly recommend. © 2019. Footstake. All Rights Reserved.